Different starting methods are employed for starting induction motors because Induction Motor draws more starting current during starting. To prevent damage to the windings due to the high starting current flow, we employ different types of starters. The simplest form of motor starter for the induction motor is the Direct On Line starter. The DOL starter consist a MCCB or Circuit Breaker, Contactor and an overload relay for protection. Electromagnetic contactor which can be opened by the thermal overload relay under fault conditions. Typically, the contactor will be controlled by separate start and stop buttons, and an auxiliary contact on the contactor is used, across the start button, as a hold in contact. I.e. the contactor is electrically latched closed while the motor is operating. To start, the contactor is closed, applying full line voltage to the motor windings. The motor will draw a very high inrush current for a very short time, the magnetic field in the iron, and then the current will be limited to the Locked Rotor Current of the motor. The motor will develop Locked Rotor Torque and begin to accelerate towards full speed. As the motor accelerates, the current will begin to drop, but will not drop significantly until the motor is at a high speed, typically about 85% of synchronous speed. The actual starting current curve is a function of the motor design, and the terminal voltage, and is totally independent of the motor load. The motor load will affect the time taken for the motor to accelerate to full speed and therefore the duration of the high starting current, but not the magnitude of the starting current. Provided the torque developed by the motor exceeds the load torque at all speeds during the start cycle, the motor will reach full speed. If the torque delivered by the motor is less than the torque of the load at any speed during the start cycle, the motor will stops accelerating. If the starting torque with a DOL starter is insufficient for the load, the motor must be replaced with a motor which can develop a higher starting torque. The acceleration torque is the torque developed by the motor minus the load torque, and will change as the motor accelerates due to the motor speed torque curve and the load speed torque curve. The start time is dependent on the acceleration torque and the load inertia. DOL starting have a maximum start current and maximum start torque. This may cause an electrical problem with the supply, or it may cause a mechanical problem with the driven load. So this will be inconvenient for the users of the supply line, always experience a voltage drop when starting a motor. But if this motor is not a high power one it does not affect much. Magnetic contactors are electromagnetically operated switches that provide a safe and convenient means for connecting and interrupting branch circuits. Magnetic motor controllers use electromagnetic energy for closing switches. The electromagnet consists of a coil of wire placed on an iron core. When a current flow through the coil, the iron of the magnet becomes magnetized, attracting an iron bar called the armature. An interruption of the current flow through the coil of wire causes the armature to drop out due to the presence of an air gap in the magnetic circuit. Line-voltage magnetic motor starters are electromechanical devices that provide a safe, convenient, and economical means of starting and stopping motors, and have the advantage of being controlled remotely. The great bulk of motor controllers sold are of this type. Contactors are mainly used to control machinery which uses electric motors. It consists of a coil which connects to a voltage source. Very often for Single phase Motors, 230V coils are used and for three phase motors, 415V coils are used. 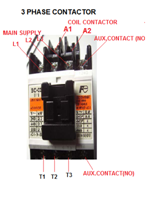 The contactor has three main NO contacts and lesser power rated contacts named as Auxiliary Contacts [NO and NC] used for the control circuit. A contact is conducting metal parts which completes or interrupt an electrical circuit. 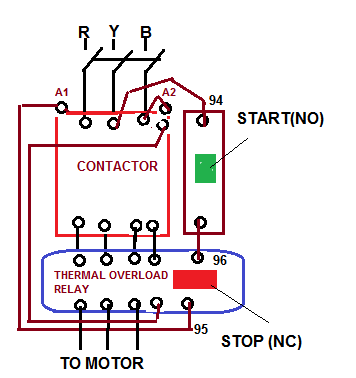 (2) Over Load Relay (Overload protection). Overload protection for an electric motor is necessary to prevent burnout and to ensure maximum operating life. Under any condition of overload, a motor draws excessive current that causes overheating. Since motor winding insulation deteriorates due to overheating, there are established limits on motor operating temperatures to protect a motor from overheating. Overload relays are employed on a motor control to limit the amount of current drawn. 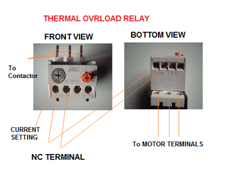 The overload relay does not provide short circuit protection. This is the function of over current protective equipment like fuses and circuit breakers, generally located in the disconnecting switch enclosure. The ideal and easiest way for overload protection for a motor is an element with current-sensing properties very similar to the heating curve of the motor which would act to open the motor circuit when full-load current is exceeded. The operation of the protective device should be such that the motor is allowed to carry harmless over-loads but is quickly removed from the line when an overload has persisted too long. Normally fuses are not designed to provide overload protection. Fuse is protecting against short circuits (over current protection). Motors draw a high inrush current when starting and conventional fuses have no way of distinguishing between this temporary and harmless inrush current and a damaging overload. Selection of Fuse is depend on motor full-load current, would “blow” every time the motor is started. On the other hand, if a fuse were chosen large enough to pass the starting or inrush current, it would not protect the motor against small, harmful overloads that might occur later. The overload relay is the heart of motor protection. It has inverse-trip-time characteristics, permitting it to hold in during the accelerating period (when inrush current is drawn), yet providing protection on small overloads above the full-load current when the motor is running. Overload relays are renewable and can withstand repeated trip and reset cycles without need of replacement. Overload relays cannot, however, take the place of over current protection equipment. The overload relay consists of a current-sensing unit connected in the line to the motor, plus a mechanism, actuated by the sensing unit, which serves, directly or indirectly, to break the circuit. Overload relays can be classified as being thermal, magnetic, or electronic. Thermal Relay: As the name implies, thermal overload relays rely on the rising temperatures caused by the overload current to trip the overload mechanism. Thermal overload relays can be further subdivided into two types: melting alloy and bimetallic. Magnetic Relay: Magnetic overload relays react only to current excesses and are not affected by temperature. Electronic Relay: Electronic or solid-state overload relays, provide the combination of high-speed trip, adjustability, and ease of installation. They can be ideal in many precise applications. Contactor is connecting among Supply Voltage, Relay Coil and Thermal Overload Relay. 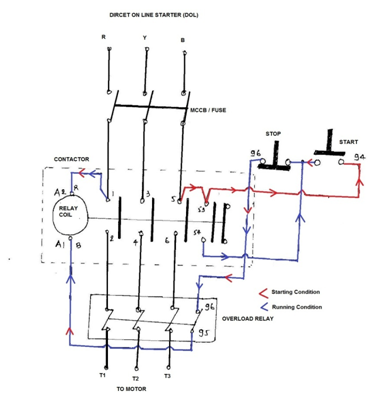 L3 of Contactor Connect (NO) to B Phase through MCCB. Contactor Point 53 is connecting to Start Button Point (94) and 54 Point of Contactor is connected to Common wire of Start/Stop Button. A1 of Relay Coil is connecting to any one Supply Phase and A2 is connecting to Thermal over Load Relay’s NC Connection (95). NC Connection (95-96) of Thermal Overload Relay is connecting to Stop Button and Common Connection of Start/Stop Button. The main heart of DOL starter is Relay Coil. Normally it gets one phase constant from incoming supply Voltage (A1).when Coil gets second Phase relay coil energizes and Magnet of Contactor produce electromagnetic field and due to this Plunger of Contactor will move and Main Contactor of starter will closed and Auxiliary will change its position NO become NC and NC become (shown Red Line in Diagram) . When We Push the start Button Relay Coil will get second phase from Supply Phase-Main contactor(5)-Auxiliary Contact(53)-Start button-Stop button-96-95-To Relay Coil (A2).Now Coil energizes and Magnetic field produce by Magnet and Plunger of Contactor move. Main Contactor closes and Motor gets supply at the same time Auxiliary contact become (53-54) from NO to NC . Relay coil gets supply even though we release Start button. When We release Start Push Button Relay Coil gets Supply phase from Main contactor (5)-Auxiliary contactor (53) – Auxiliary contactor (54)-Stop Button-96-95-Relay coil (shown Red / Blue Lines in Diagram). In Overload Condition of Motor will be stopped by intermission of Control circuit at Point 96-95. When we push Stop Button Control circuit of Starter will be break at stop button and Supply of Relay coil is broken, Plunger moves and close contact of Main Contactor becomes Open, Supply of Motor is disconnected. Peak starting current: 6 to 8 Full Load Current. Easy to understand and trouble‐shoot. It provides 100% torque at the time of starting. Only one set of cable is required from starter to motor. Motor is connected in delta at motor terminals. It does not reduce the starting current of the motor. High Starting Current: Very High Starting Current (Typically 6 to 8 times the FLC of the motor). Mechanically Harsh: Thermal Stress on the motor, thereby reducing its life. High starting Torque: Unnecessary high starting torque, even when not required by the load, thereby increased mechanical stress on the mechanical systems such as rotor shaft, bearings, gearbox, coupling, chain drive, connected equipments, etc. leading to premature failure and plant downtimes. DOL starting is sometimes used to start small water pumps, compressors, fans and conveyor belts. The safety or comfort of those using the equipment may be compromised by sudden starting as, for example, with escalators and lifts. Thanks for the info, man..Its so brief and to the point. How do you choose the right cable, MCB, Contactor, overload sizes for induction motors. Any method? How do you choose the right cable, MCB, Contactor, overload sizes for induction motors. Any method? in many industry dol starter used for upto 15 or 20 hp motor. but there also used upto 30 hp motor. why ? As Torque is directly proportional to Current, for loads of higher torque requirements( like hammering metal industries)even for 50HP squirrel cage motors, where the electric installation network is much stronger – still use DOL starting, mostly in Asian countries. Very helpfull to know working even i am a fresher diploma engineer. How would an e-stop be incorporated into this circuit, through the stop connection and contactor? By e-stop, if you mean emergency stop, then use this instead of the stop push button which is generally a part of the control wiring of a DOL Starter. A simple emergency stop (either push-pull / twist to release / key release) can be used with an NC contact. But generally speaking, Em stop is not really required for starters. If you have safety issues, then pls go ahead with em stop buttons with key or padlock. Cant we use dol starters for Axilary Switching of Working motor to spare motor Automatically. The above topic was very interesting & use full for me. Now I understood what is DOL starter. too informative & very useful Sir …keep rolling such a nice stuff…thanks a lot. I have a question I would like to ask I am an electrician but I do not have any experience in control wiring I have installed a DOL starter on a pump but they now want a float switch and a flow switch to control the circuit can you please draw a circuit for me. could you please send me also the diagram for the DOL starter with float switch that switches on and off. I have a situation wherein the motor is initially started using a start push button. But in case of a power cut, the motor has to start automatically (in an instant with minimum delay), i.e. without me having to use the start push button again. I tried using On delay timers but the result is not very satisfactory. Let me know your views. You smashed it once more my buddy carry on the excellent work I generally get excitement from your articles! DOL Starter for Fluorescent Lamp !!!!!!!!!!!!!!!!!!!!!!!!!!! Why not we can control lightings too,through Direct Online Starters, like in stadium,auditorium etc. This is a coommon practice nowadays to switching on group of lights together.Insteed of going for each and every switch. One of my consultant proposed DOL starter for 150 hp motor. Is it possible. Very nice work…itz clear cut…thanks a lot..
does it make a difference how far the DOL starter is from the motor? Is it possible to use DOL starter for 600 KW motor. You are so wonderfuf. Please send email about autotransfomer: diagram and its operation. Thanks and be blessed. Thanks for the information. Can you please explain how a auto, local DOL starter works? D.o.l starter is which motor will in used??? Read Post Carefully..It is already given in the Post !!!!! Water pump 60 kw we can use the DOL methode to start this pump and please u can calculate the circuit breaker ,contractor and the cable size if the total length is 120 meter? thanks for sharing your knowledge. Now i understand about dol. thanks i have verify this concept practically. Please inform. upto how much KW we can use DOL starter. Also please give the range of Star-Delta starter and starting KW for preferring VFD. my worries is this motor will start and stop frequently will affect the transformer and how to reduce the started current of the motor ? How can i check the DOL starter? Whether it is in good condition or not..
Do DOL starter gives energy saving? Big up, You are wonderful. It is good then ,how about revising and forward contactor wiring drawing ? dear sir my starter on off switch is not working. i have to press contactor manually by tester. i think may be coil is not energising. . is there any solution ? please guide me. i am using this starter at presure switch of compressor. Thank you very much for your useful information regarding direct on line starters. I was not familiar with IEC contactors and scoured the Internet trying to locate a wiring diagram for one. Your information provided the answer I needed and your explanation of the operation of DOL starters was very helpful as well. Keep up the good work! Have you already prepare any concerning electrical installation? if yes how can i get them? Have you already prepare any notes concerning electrical installation? if yes how can i get them? Is that possible to run two 5HP motor with one DOL starter ? Do any one have references as per IEC or NEC for what range Min to Max kW ratings which type of Starter to use 1). DOL 2).Start Delta 3).Softstarter , kindy please if any one have any references please provide. i have a great honours for you for providing us with such a good knowledge about the motors and the contactors–they are all good to learn for the people like me!! I’m working as an electrical helper in jagdamba steel pvt.ltd. simara nepal. it would be great to me if you provide me with a power and control diagram of dol and inching. I have an question,if i use indicating light at outgoing to motor side using star connection,is there any problem when the motor running time? my outgoing lights can works? Your guide was very informative and helped me change a new lathe that was originally wired for three phase to a single phase supply with a VFD. With your help, I was able to properly wire the contactor and overload relay to control the main power supply to the lathe. Thank you very much for your instruction! Can u please guide me. I’m preparing a control circuit for two individual DOL starters with an interlock where one dol works and if the pressure drops the other dol switch on automatically and and first one should be off manually. and this should be possible in both of them. i need to ask that can i connect DOL starter with 125kw motor at any condition. plz help me out. very helpful notes,wel done sir for grdat job. my DOL starter connected with compressor, starter makes frequent noise after some interval, can you help me find out the problem. hi, i need help on how to connect 3 phase motor with 4 heater, individually heater is working. when temp in the tank reaches 80 centigrade, heater coil should stop, but motor pump is running. Oneline diagram of DOL Starter of 3-phase induction Motor. your doing a wonderful job, your providing useful information in the very easy way. Can you plz help me with the explanation on changeover switch? Very useful indeed. Projection through video will also provide Filip to the mission. I found it helpful to me as an electrician. Can it be used for frequent starting and operating in forward and reverse directions. Hi, can i know what will cause a DOL starter to fail? How to work 1 phase submarsibal pump starter ? What happen if we remove middle phase of 3 phase supply in DOL starter, is the starter stop the motor when it is in running condition? 2)Can we build it ourselves or do we need to get it made by someone or is it readily available. 3)For each option of building, getting it built or buying – list the process to be undertaken for procurement of the final starter type. Could we use DOL starter for 3 phase 11 KW water pump ? hii i have read your article and its explanation is excellent.